If there’s one thing that can make web browsing annoying, it’s definitely ads. Luckily, iOS now supports ad blockers which can hide the ads we would normally see in Safari. Our list of best ad blockers for iOS contains only apps that work flawlessly, but also receive regular updates. There are numerous ad blockers for iOS which have disappeared from the App Store or haven’t received updates in a long time but you won’t find any of those on our list. Before anything else, you should know ad blockers that hide ads in Safari only work on devices with support for 64-bit architecture. Also, you can’t simply download and install an ad blocker. 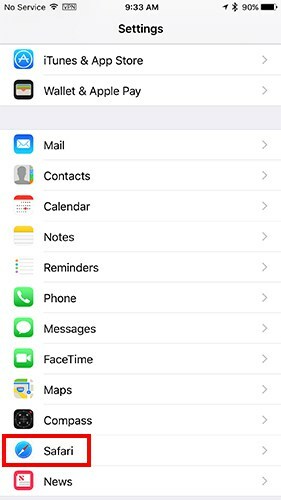 You also need to enable it in the Settings app on your iPhone or iPad. 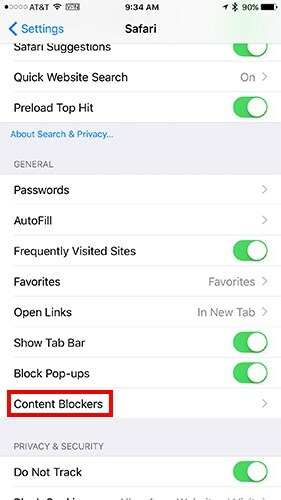 On your iPhone or iPad, open the Settings app and go to Safari -> Content Blockers. On the next screen, you can toggle on any of the currently installed ad blockers. As you can see, you can have more than one ad blocker enabled at the same time. This is optional, of course, but certainly possible. Now that we’ve got this out of the way, let’s see what are the best ad blockers for iOS. 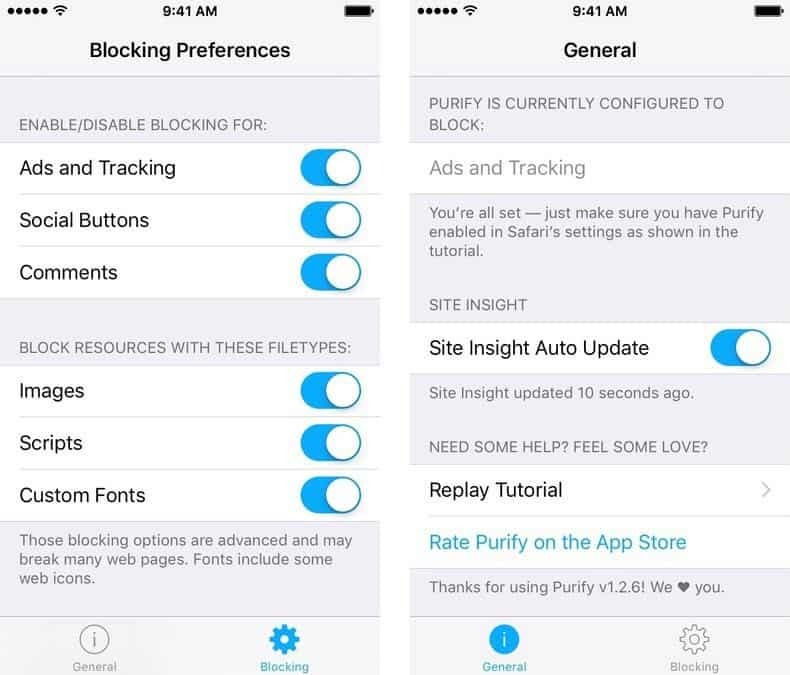 Purify is one of the friendliest ad blockers for iOS available at the moment. While you can benefit from interesting features like the ability to block scripts, images and even custom fonts, the app works excellent with the default settings. 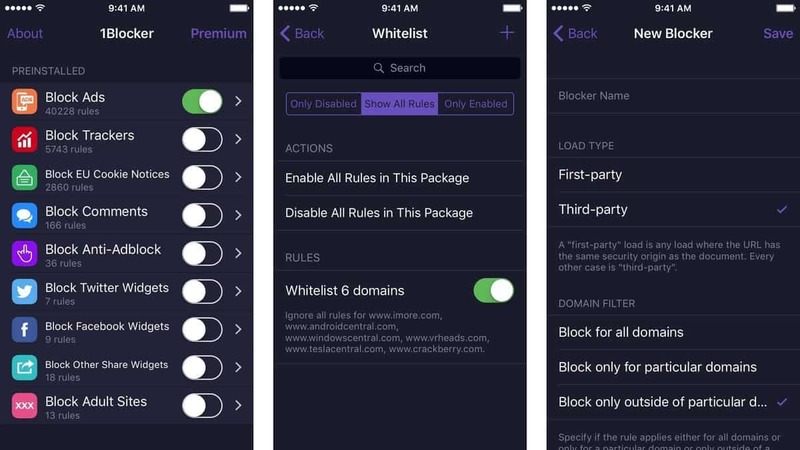 Furthermore, Purify provides a whitelist feature accessible via Safari’s Share Sheet so you can easily whitelist your favorite websites while browsing the web. 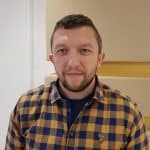 While the options to block images, custom fonts, and scripts have nothing to do with ad-blocking, using them can significantly speed up page load times and also save some battery. 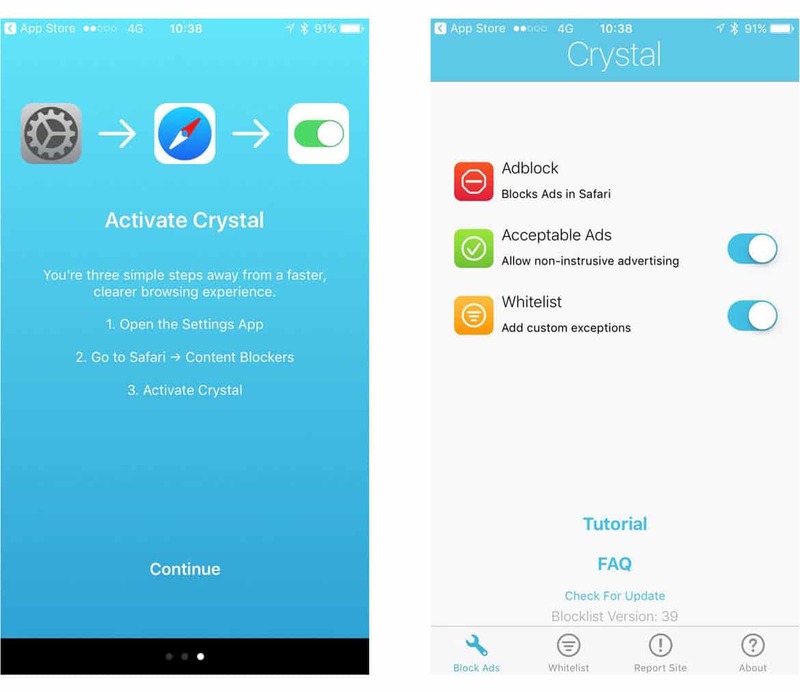 Crystal is one of the best ad blockers for iOS for good reason. The app makes it super easy to whitelist websites and even has an option to allow “non-intrusive advertising” so you can support the sites that don’t display annoying ads which make it more difficult to view content. There’s not much in the customization department but if you need a no-frills ad blocker that just works you’re going to love Crystal. AdBlock works in a different way compared to most other ad blockers. The app relies on your device’s VPN connection to block all ads, including the ones displayed in apps. This way you can surf the web, play games, and use apps without seeing any ads. For AdBlock to work you will need to alllow the VPN configuration and you might get a warning from Apple but no need to worry. It’s true that VPNs can allow tracking whatever you do on your device but AdBlock doesn’t send any data to its servers and you will need the VPN configuration if you want the app to block ads in other apps besides Safari. If what you need is a highly customizable ad blocker, 1Blocker makes an excellent choice. It lets you set custom rules for cookies, ad blocking, trackers, adult websites and so on. Of course, it also has a whitelist feature as well as a blacklist function among other options. However, keep in mind the app is free to download but that’s just a trial. If you want to use more than a feature at a time you can unlock the full app via a $4.99 IAP. These are our favorite ad blockers for iPhone and iPad but there are other options worth checking out. Let’s not forget about Block Ad by Neverads which is completely free, the fact that Opera has a built-in ad blocker and also Firefox Focus, Mozilla’s privacy browser. While the latter two options would require you to give up Safari, they are definitely excellent choices for an ad-free browsing experience and worth checking out. 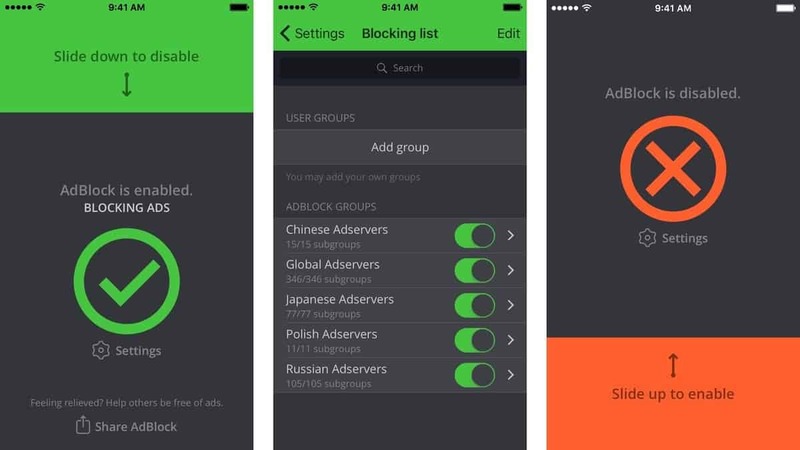 What app or method are you using to block ads on your iPhone or iPad? We’d love to hear your thoughts so drop us a line in the comments section.